Ethiopia’s much hyped 2020 General Elections are two years away and people are already buzzing with excitement and glee. Ethiopia may be on the brink of its sixth multiparty elections, but the country is yet to conduct a nationwide electoral campaign agreed by both international observers and voters to have been free and fair. The democratic process has for years been scoffed at by Ethiopians who saw it as little more than a tool to legitimize the ruling Ethiopian People’s Revolutionary Democratic Party (EPRDF)’s maintaining of a stronghold on political power. But current Prime Minister Abiy Ahmed has gone to great lengths to assure his countrymen that things will be different this time round. He has already enacted groundbreaking reforms that has paved the way for banned opposition elements to register as political entities and engage their constituencies. People are daring to dream that 2020 will be the year they shape their destiny at the ballot box for the first time. And yet, the men and women whose names will be on the ballots don’t appear to be doing much out of the norm, despite the magnitude of the occasion. For the opposition, which needs to grit its teeth to ensure it can hold its own in a nationwide battle of wits, there appears to be no serious upswing in activity or intention. As it stands there appears to be no indication the various opposition elements will break away from their shadows and sincerely chase after the electoral scalp that could see a handover of power from the EPRDF to someone else. For much of the past three decades, in an effort to circumvent possible challenges to their rule, EPRDF government officials have regularly ordered opposition party members and sympathetic activists to be harassed, detained, tortured and exiled. To further counter their influence, the government would deploy young, zealous party adherents all over the country and everywhere humans are seen to be interacting. University and college campuses for instance, have long been infiltrated by regime narrative parroting cadres and students are coaxed if not pressured to register as party members and supporters. In the aftermath of the 2005 election which saw police gun down nearly 200 protesters in Addis Ababa, openly expressing defiance to the EPRDF on campus or in the workplace became tantamount to shutting the door on employment, promotion and in some cases, graduation. People give in to implicit threats and intimidation, keeping dissenting thoughts to themselves to avoid triggering the radars of party members tasked with reporting on non conformists. Ethiopia’s prisons have always been overcrowded with political prisoners accused of anything from opposition party membership to expressing sympathy for them on social media. By the time ballots are set to be cast, people are worn down and just want it to be over. Government appointed neighbourhood authority figures go door to door in Addis Ababa with a list of names of people who haven’t voted yet. You are urged to vote and vote EPRDF. Not as if there was much choice. Remaining opposition parties that haven’t been banned from participation or had its candidates jailed are by this time splintered, lacking leadership and in total shambles. 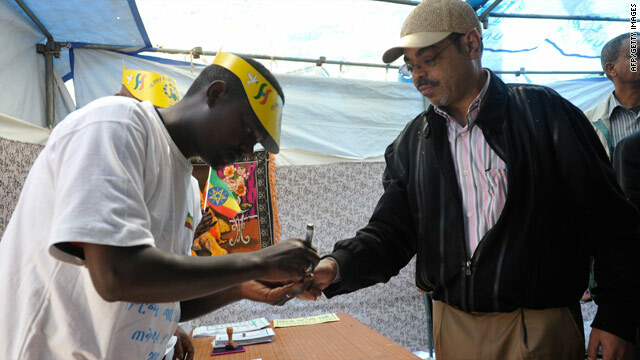 One could say that elections in Ethiopia are often concluded years in advance. The alleged vote rigging that takes place afterwards is often completely unnecessary to seal the deal. With the ruling party spending taxpayer resources and deploying national security forces to nip potential political threats in the bud, the lopsided electoral results that saw the government win with “100% of the vote” during the last elections in 2015 no longer raise eyebrows. The entire process has always been a farce. But that was before the appointment of a young charismatic reformer as EPRDF party chairman in April of this year. The end of the Tigrayan elite dominated EPRDF was on the cards after massive uprisings in the Oromia and Amhara regions brought the nation to a standstill and hit nails on the coffin of those who ruled with impunity. Empowered by the sacrifices of protesters who died in the thousands for him to ring in the changes, Abiy Ahmed decisively shed the oppressive label of his party and declared the political process open and accessible to all. Political prisoners were released in the tens of thousands and it no longer became a federal crime to associate oneself with opposition parties, their members, emblems, flags and symbols. Armed secessionist groups based in neighbouring Eritrea were encouraged to give up the armed struggle for the peaceful political one at home. Capitalizing on the offer of an amnesty as well as a peace deal struck between Ethiopia and Eritrea, several groups relinquished their weapons and returned home. The once criminalized Oromo Liberation Front, Ogaden National Liberation Front, Tigrayan People’s Democratic Movement and Ginbot 7 groups were decriminalized and allowed to legally register as political entities. For years, these groups were designated terrorist entities and their members jailed, tortured and murdered by the Ethiopia security apparatus. 2018 was marked by formerly exiled militants, activists, journalists and politicians making long awaited triumphant returns to the country that had declared them persona non grata. The dawn of a new era for many, and Africa’s feel good story of the year. Prime Minister Abiy Ahmed went a step further and traveled to the United States this year where he met with the large Ethiopian expat community over there. He sat down with representatives of various political entities, entertaining their inquiries and urging them to return home and take part in a political process he promised would flourish. The Ethiopian government has even gone as far as financing the returns, paying airfares and living expenses of a yet to be determined number of opposition party affiliated politicians and activists. Furthering highlighting the current administration’s sincerity with welcoming dissenting voices with open arms is the appointment of Birtukan Mideksa as Head of the National Electoral Board. Birtukan, is a former judge and politician who challenged the EPRDF leadership in the hotly contested 2005 elections and ended up paying for it, being in and out of jail before being handed a politically motivated life sentence in 2008. After two years in detention and nearly a decade in exile, this woman, known for her fierce opposition to the EPRDF government will be tasked with ensuring it plays by the rules this time during the 2020 elections. This is a woman the late Ethiopian Prime Minister Meles Zenawi promised reporters would never be released from prison. The political space has definitely opened up for all. The government has gone beyond what was required of it to facilitate the return and registration of those who feel they ought to be given a shot at the country’s reins. With less than two years to go before the long awaited vote, parties should be campaigning for their nationwide electoral assaults. And yet, despite the people’s desire for elected representation, the political opposition has been slow, if not stagnant in their efforts to capitalize on the newly gained freedoms. The desire for democracy hasn’t correlated with an upsurge in campaigning, societal discussion or attempts to win over support by the opposition. 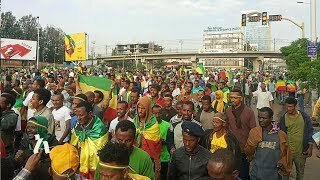 The return of the opposition to spectacular and rousing by Ethiopians across the country has been well documented. Subsequent actions to convince people that they have a platform which they can build a national government upon meanwhile, have not been. First of all, Abiy Ahmed and his collective “Team Lemma,” political outfit have taken the time to tour the country addressing citizens at town hall style forums, allowing himself to be grilled by those he encounters. He has delivered his national vision and made a sincere effort at winning hearts and minds. To challenge Abiy and the EPRDF would require presenting these people with an appealing package that supersedes the one put on the table by Team Lemma. It would require fighting for the parliamentary seats won in the last election by the EPRDF, which is all 547 of them. Unfortunately, it appears that a contagious strain of political myopia has collectively infected some of the major political entities that are expected to provide the fiercest challenge to EPRDF rule. Ethiopia may be blessed with a plethora of seasoned politicians, some of whom have been jailed, tortured and experienced hardships that would melt anyone. But so far none have made an attempt at venturing far away from their constituencies despite the 2020 elections being federal and not just regional elections. Oromia bound, as in bound to Oromia? Veteran politician Bekele Gerba of the Oromo Federalist Congress spent the earlier part of this year languishing in a prison, refused medical assistance and suffering from an ailment that nearly cost him eyesight in an eye. An outspoken regime critic and longtime advocate for the Oromo people, his release in February was widely celebrated. Since his release he has galvanized his support base in Oromia, touring the region and staking a claim for seats in the region. The Oromo Federalist Congress is on paper, a member of the Medrek political coalition that includes parties representing peoples from all four corners of the country. But the OFC has not made it clear if they will form a coalition with any of the former Medrek’s coalition partners this time round. The status of the continuation of the Medrek entity as a party, is in doubt. The OFC is expected to be the EPRDF’s biggest challenger in the Oromia. To improve their chances in the region, the OFC announced it would merger with a returning Oromo Liberation Front faction (OLF) and its leader Dawud Ibsa. It’s a tactically smart move as the former rebel fighters enjoy a mythical status from their decades of struggle, while the OFC can count on a lot of support due to their having never been exiled from the country. OFC and its leaders such as Bekele and OFC co-chairman and former Political Science professor Merera Gudina were either behind bars or on the ground, issuing party communiques throughout the Oromo People’s uprisings of 2016. But the OFC and its charismatic leaders aren’t known to be currently engaged in any talks with the leaders of political affiliates hailing from elsewhere in the country. As mentioned before, there is no word of whether the duo would entertain resuscitating the Medrek coalition that had them allied with political parties from South Ethiopia, Tigray and elsewhere. Ethiopia is much more than just Oromia and with no concerted effort to appeal to the masses of the country outside of OFC strongholds, it may just suggest that the party doesn’t have much of a vision for the country. It’s somewhat incredulous to notice this lack of ambition in the OFC camp that sees its politicians refrain from even touring parts of the Amhara, Tigray or Southern Regions. The possibility of these upcoming elections being free and fair didn’t come at a cheap cost. The reform was ushered in on the backs of protesters who took to the streets chanting slogans and being shot at with live ammunition for nearly a year. One would assume that the party based in the region where the movement was ignited would attempt to go all out and make the most of the opportunity. 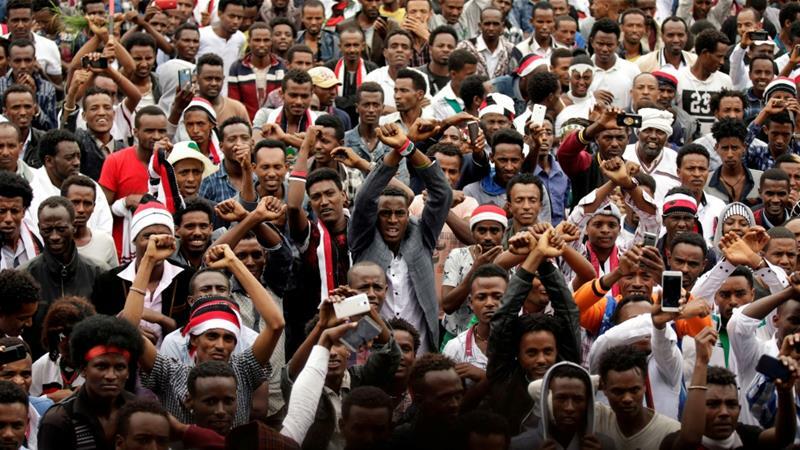 One must also take note that the Oromo youths who spearheaded the protests themselves would sync their movement with that of Amhara youths and declare their solidarity with the Amhara Protests movement. Oromo activists, chief among them Jawar Mohammed, made the most of their returns from exile, traveling the country and meeting with politicians and community leaders across the country in an attempt to foster understanding amongst peoples of various ethnicities. State media affiliates Oromia Broadcasting Network and the Amhara Mass Media Agency recently announced a sister partnership between the two organizations. While these and more have taken these steps for the common good and in an attempt to smoothen interethnic relations, not even potential election victory has thus far enticed the OFC to go the extra mile. Meanwhile, Berhanu Nega’s Ginbot 7 movement is also among those who returned to much fanfare and have done little since to justify the hype. Ginbot 7 has a support base centered principally around the capital Addis Ababa and parts of the Amhara region. They aren’t expected to register electoral victories elsewhere and a disappointing turnout at a planned September rally in the Amhara regional capital of Bahir Dar suggests that they’ll have their work cut out for them even among Amhara voters. For what it’s worth, the Ginbot 7 movement has attempted to organize meetings of its supporters outside of their strongholds. A controversial and likely politically motivated decision by the Harari regional government citing security concerns saw that meeting canceled. Ginbot 7 have gone as far as the Gurage zone and Adama in Oromia to meet with supporters and hold meetings. Despite this, Ginbot 7 continue to show little room for compromising on ideals that will arguably lead to the organization isolating itself from a large section of the population. Its leaders continue to cater to the idea of dissolving Ethiopia’s ethnicity based federal system. Implemented in 1996, differing ethnic groups have a degree of autonomy and self rule that they are unlikely to be willing to give up. It has been over two decades since Ethiopia became a country where indigenous language are permitted to thrive in the workplaces and education systems of their respective regions. And yet Ginbot 7 are adamant that these advances must be reversed to preserve a national unity they say is key to any sort of progress. The group has never officially clarified what their new look country would resemble but its expected they support a restoration of the previous “regional” rule of the country where Amharic was the sole working language nationwide. A refusal to budge from this polarizing stand will see the group make no inroads amongst non Amharic speaking voters. As Ethiopia is a country where seven of its nine regions use languages other than Amharic as working languages, such a political stance would be a declaration of open hostility towards many of the country’s diverse linguistic groups. As such, Ginbot 7 do not have much to show in terms of inter-ethnic alliances. The movement discussed and later confirmed it would merge with the Blue Party, formed in 2013. Problem is that this move does precious little to ideologically diversify the Ginbot 7 voter base nor does it extend its outreach beyond the capital city and urban zones. The Blue Party and Ginbot 7 are politically aligned and the merger is hardly surprising. Similar to the OFC, Ginbot 7’s lack of expansion prevents it from forming the sort of alliances needed to win the votes that will see it catapult over the EPRDF. 70% of Ethiopians are under age 30, meaning the large majority of the population have grown up accustomed to the federal system that groups like Ginbot 7 are hell bent on dissolving. Content to present their vision of what a united country should look like, Ginbot 7 are also failing to realize that the masses under 30 are primarily concerned with employment and rising living costs and not reincarnating a version of the country that they weren’t around to witness. The stark refusal to cater to a country of diverse views, languages and desires seriously dent any hopes Ginbot 7 may have of staking a claim for leadership of the government. Just like the OFC, it has formed a coalition with a like minded political entity, but its rigidity suggests that Ginbot 7 come up short when it comes to carving out a viable national agenda. Especially one that can compete with what Team Lemma at EPRDF HQ are promoting. Since the overthrow of the Communist Derg regime in 1991, people have been promised the opportunity to elect their own officials only to be deceived repeatedly. For the first time in a quarter century, after the deaths, detentions and maimings of so many activists and democracy advocates from the town of Ginchi to the city of Bahir Dar, the country appears to be on the brink of its first democratic elections. Unexpectedly, it is the EPRDF government that appears more eager and ultimately more prepared for the electoral showdown. These are two of the major political entities and groundshakers, but it’s unfortunate to see other parties follow suit and offer nothing in terms of nation building. In a widely viewed exchange with LTV’s Betelhem Tafesse, Desalegn Chane, chairman of the National Movement of the Amhara (NAMA) political party, claimed that his organization, despite its name, was a national party. One that would provide Ethiopians with an alternative from the government. How the NAMA, a political organization dedicated to the plight of subjugated Amhara, an organization whose leadership has never cared to comment on the Oromo-Somali conflict or the communal violence in Moyale could aspire to replace the EPRDF is inexplicable. In the Somali region meanwhile, the Dulmidiid movement was known for its rights advocacy and opposition to ousted former regional leader Abdi “Illey.” Their opposition has dissipated since the appointment of a former opposition figure in Mustafa Omer as regional President. This virtually dissolves the region of a political opposition presence aside the Ogaden National Liberation Front, who for themselves have declared secession from Ethiopia as being their end goal. Less than two years to go, we are yet to see the rise of a contender with objectives that extend beyond securing their home turf or rallying like minded individuals behind them. The opposition needs all the help it can get if it has any hope of forming government. But despite this, general stubbornness and egotistical notions have prevented some of the opposition’s power players from breaking beyond the ethnic and ideological divide. Thus far, the EPRDF leadership of Prime Minister Abiy Ahmed which has warmly received most of these dissenting entities and promised them a clean, fair fight in 2020 appears poised to form government once again. The EPRDF will likely lose seats in certain regions with a fair process and voter count. But unless 2019 ushers in a change in mentalities, it does appear that the reformists can count on the nearsightedness of its opponents to keep them on the outskirts of Arat Kilo. Beyond this, one question remains that many may one day be tempted to ask. Will the generation that sacrificed lives and limbs for this opportunity be able to forgive politicians who are thus far unwilling to sacrifice their pride for it?